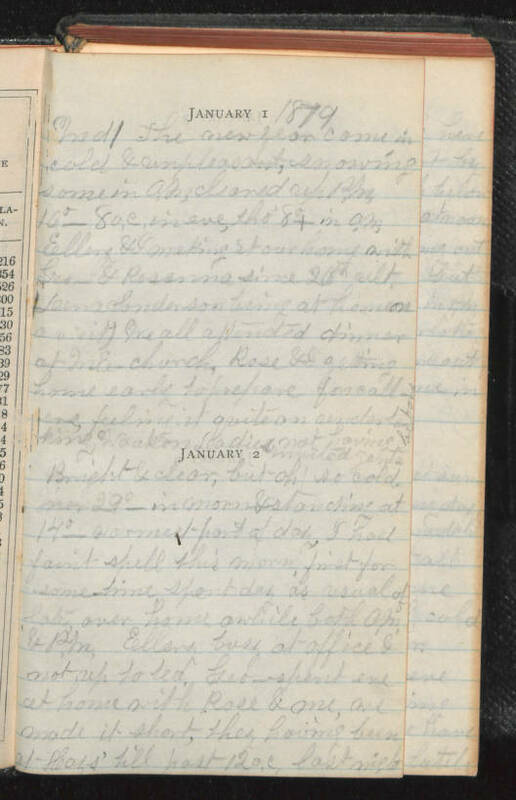 January 1 1879 [illegible] The new year came in cold & unpleasant, snowing some in A.M. cleared P.M. 16°- 8 o.c. in eve, tho' 8°+ in A.M. Ellery & I making it our home with Geo- & Rosanna since 26th ult. (Leona Sanderson being at home on a visit) We all attended dinner at M.E. church, Rose & I getting home early to prepare for callers feeling it quite an (illegible) , Waukon Ladies not having invited gents January 2 Bright & clear, but Oh! so cold, Mer 29°- in morn & standing at 14°- warmest part of day, I had faint spell this morn, first for some time, spent day as usual of late, over home awhile both A.M. & P.M. Ellery busy at office & not up to tea. Geo- spent eve at home with Rose & me, we made it short, they having been at Hass' till past 12 o.c. last night.